Bet9ja updates its mobile Android app very regularly so that you can experience its newest features when you decide to download it. You won’t find the Android app in Google Play because Google Play doesn’t usually support gambling apps (with a few exceptions). So the only way to download it would be through a .apk file. The look of the mobile platform is simple, but it’s pretty much satisfactory. The platform predominantly uses dark colours like black and grey, but it also uses white, green, and red to complement the hues together. The layout of the platform is what you would expect from a mobile platform that’s mobile-optimised. Overall, the Bet9ja Android website has excellent UX. Step 1: Go to your Security Settings and enable the download from ‘Unknown Sources’ so that you can download the .apk file. Step 2: Go to the mobile downloads portion of the website and download the .apk file of the app that you want to download (Casino app or Sportsbook app). If you can’t locate the downloads page, you can go directly to promo.bet9ja.com/mobileapps. Step 3: Click on the downloaded .apk file from your Downloads section and install the app. Step 4: Wait for the app to install. Unfortunately, you also won’t be able to find the Bet9ja app in the iTunes store, and there doesn’t seem to be any way to run the .apk file on Apple devices such as iPhones or iPads. That’s why your best bet would be just to use the mobile version of the website. To do this, you have to type in the Bet9ja website URL using your mobile browser, and you’ll automatically be directed to the mobile version of the website. Concerning soccer, which happens to be Bet9ja’s biggest market, there are a lot of big cups and leagues that they offer such as Soccer Specials and Confederations Cups. There’s also live betting and in-play betting in all events. However, there aren’t any horse racing and dog racing markets. The Goalscorer is a type of event where you can bet on how many goals are scored by a certain player. It’s an interesting little side game that you can play outside of sports betting. 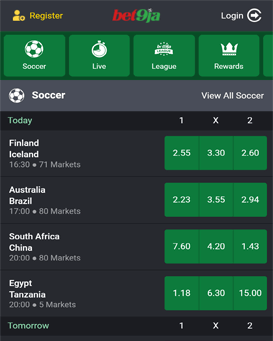 One of the most helpful things that the Bet9ja mobile app offers is a very comprehensive search tool wherein you can find a lot of betting markets as well as very comprehensive details about each one. There is also a cash out feature which happens to also be very helpful if you want to bet strategically. With the cash out feature, you can take your money out even before the event has ended. This allows you to secure your profits right away. Virtuals are a pretty good alternative to the usual betting. With virtuals, you won’t really be betting on real events. You’ll be betting on simulated sports events which are a bit different from the traditional betting but are still a lot of fun. The mobile site version is what non-Android users are going to access, so it’s important to know what the mobile website is all about. First, you’ll notice that the mobile site is actually quite similar to the app, although the feel is a bit different. The mobile site version is also rather interactive and has straightforward navigation features. It’s not really the prettiest mobile website you’ll find in the industry, but it definitely does have its own charm and unique look. It sports a colour combo of white, green, and dark grey. What you’ll find interesting is that the shade of green and white used by the website is the same shade as used by the Nigerian flag. This allows Bet9ja to target a vast Nigerian market and make the platform appealing to them. When you use the app, you’ll see that it makes heavy use of pictures and graphics. You won’t find much text because of the big buttons. This is great because it’s more appealing and more accessible to the eyes. One of the good things about Bet9ja is that you don’t have to download a separate app to access the casino unlike with the other betting apps. All you have to do is locate the app (or the mobile website), and there is a button that says Casino. Just click on that button, and you’ll be brought to the Bet9ja casino. Here, you’ll get to have your choice of casino games such as slots, table games, arcade casino games, and much more. You’ll even have the chance to try out the live casino which enables you to play with actual dealers in a live platform. You can also play lucky dice, TV games, roulette, and even numbers games that can let you earn a lot of profits. While the mobile app and the mobile site version are pretty similar to each other, there are quite a few significant differences to take note of. Here are some of the pros and cons of both. There doesn’t seem to be an exclusive mobile bonus as of the moment, but there are still a lot of other exciting bonuses and promos that you may also enjoy. One of them is the Welcome Bonus wherein you can get a 100% Welcome Bonus of up to 100,000 Naira. Another is the 170% Multiple Bonus wherein you can get up to 170% for betting on all events. For instance, if you bet 5 games, you get 5% bonuses, and if you bet 24 events, you can get 100% worth of bonus. For non-Android phones, you won’t really have to worry about system compatibility because you just need to enter the URL in your mobile browser. You do have to take note of the system requirements for the Android app though. Basically, you need to make sure that your Android device has an OS version of 4.1 or higher. For deposit methods, Bet9Ja offers a pretty good list of deposit methods. Unfortunately, there is only one withdrawal method. Check out the tables below for more information. Bet9ja is a rather new player in the industry being only 5 years old as it was founded in 2013. It happens to be one of the biggest Nigerian bookmakers in the industry and offers some of the best odds and game lineups. Bet9ja is managed by KC Gaming Networks Limited and has a license in the State of Osun and the Lagos State Lotteries Board. Currently, they’re serving many customers in various Nigerian states. While it is known for its main website, it also has an excellent mobile platform. For those who want good odds, great games to play, and a very interactive platform for mobile devices, Bet9ja is a great bookmaker to sign up to. If you have questions about the Bet9ja mobile app and mobile site version, refer to the FAQs below and their corresponding answers. Why can’t the .apk file work for iOS devices? iOS devices are quite particular when it comes to third-party apps. That’s why the only way to download one would be to look for it in the iTunes store. Unfortunately, there is none in the iTunes store so the only way to access it would be to access the mobile version website. Can Windows phones and Blackberries install the app? Only Android devices may install the .apk file as of the moment. If you’re using a different phone, you may just access the mobile version of the website. My Android doesn’t want to download and install the app. What is the problem? It could be because your Android is not compatible with the system requirements. Another possible cause would be that your Android blocks off third-party apps. Go to Security Settings and enable Unknown Sources to allow your Android to download the .apk file. Does the mobile platform have any other currencies aside from Naira? Naira is the only available currency that Bet9ja supports as of the moment. Is there a live chat customer service feature for the mobile platform? There is no live chat feature that is offered by the betting platform as of the moment. The easiest way to contact support would be through the customer hotline given in the contact page. Is there a live streaming option for the mobile app? Live streaming is currently not available for the Bet9ja mobile app. There is also currently no news as to whether they will be adding one in the future or not. Bet9ja is currently only available solely for Nigerian customers. With regard to the game selection, betting markets, odds, bonuses, in play games, and features, Bet9ja definitely doesn’t disappoint. In fact, it has one of the best mobile platforms that you’ll be able to find in the mobile gambling industry. While their app or mobile site may not be that flashy and glam, their mobile platform is fully functional and includes a variety of very nice features that a lot of players can enjoy. Bet9ja is also very generous when it comes to rewards and bonuses. In fact, they offer some of the most generous bonuses that you’ll find—especially their very high welcome bonuses. Of course, this doesn’t mean that Bet9ja is the perfect mobile gambling platform already. There are a few cons that come along with such a great platform. First of all, there is no dedicated app for iOS. While they have a nice app for Android, iOS users who are also app users will be slightly disappointed if they can’t find an app for iOS in the iTunes store. Some other small cons would include the lack of live streaming features and the lack of a race book. A live streaming feature is prevalent with betting platforms these days because it gives a better user experience. Without a live stream feature, Bet9ja does lose a bit of point compared to its competitors. Since they also don’t have a racebook, they’re actually missing out on a vast market of horse racing and greyhound racing punters. Other than those, Bet9ja is actually pretty good as a mobile betting and casino platform. Both the sports book and the casino do not disappoint when it comes to overall experience and features. That’s why Bet9ja still deserves an 8 over 10.